Nobody wants to sit through a meeting and feel it was pointless, so why is up to half of the time attendees spend in meetings wasted? It demoralises your team and is unproductive. 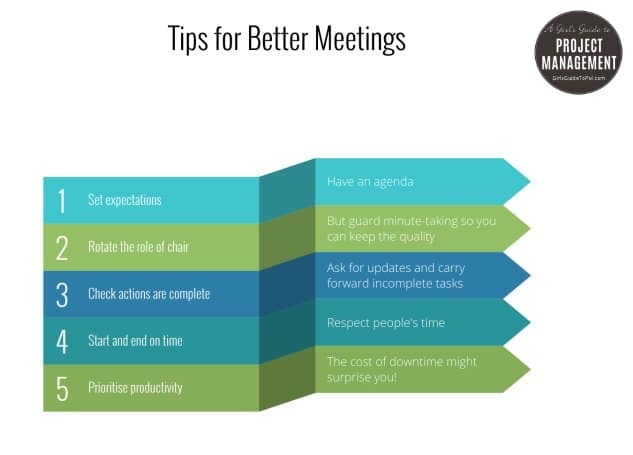 Putting some thought into the objectives and format of your meeting in advance will allow you to get the most out of your attendees’ time. Take this project as an example. The Swedish police investigation support project, PUST (Polisens Utredningsstöd) ran along Agile lines and involved daily stand up meetings. However, with a team of around 60 people, the meetings became difficult to manage. The project team managed to get round this by splitting the meetings into productive, shorter sessions. First thing in the morning, the feature teams (made up of a requirements analyst, a tester and developers) met for fifteen minutes. After this, there were synchronisation meetings of the specialist groups: testers from each team met, a developer from each team met and the requirements analysts met, again for fifteen minutes. This enabled all the feature teams to synchronise their work effectively with the other teams. Finally, there was a third daily meeting, project synchronisation, in which a cross-team group discussed the whole project with the project manager and this was often attended by the project board. Three meetings instead of just one? How can that be better? It might seem like a lot of meetings, but the whole thing was completed daily in 45 minutes. Everyone started the day knowing exactly what was being achieved. These meetings were called the ‘daily cocktail party’ with a focus on being upbeat, although I don’t think at that time in the morning they had actual cocktails. Why has your meeting become unproductive? The shorter the meeting, the more focused people have to be to get everything discussed in the session. This can really cut down on chitchat and diversions. 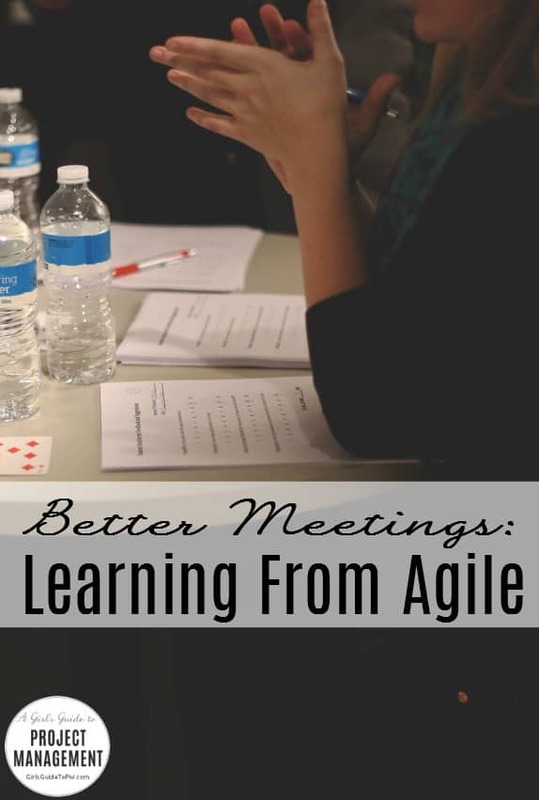 Another technique used often by Agile teams is to remove the chairs in the room – Agile meetings are called stand ups for a reason. If your meetings are not creating the output you hoped for, you can cancel them; there is no requirement for a weekly project team meeting if you find that you are working closely with team members throughout the week and the formal meeting has become redundant. However, before you take that step, ask yourself why the time has become non-productive. If a meeting would truly be irrelevant to all the participants, then cancel it; do not waste people’s time with a pointless get-together. But if you believe that arranging a time for everyone to be together would genuinely be beneficial if only you could increase the collective productivity, then think what you can do to make the meeting more efficient. Make sure people know why they are there, so they can plan their contribution in advance: send out an agenda and objectives for the meeting. Allowing anyone to suggest agenda topics can mean that the final version of your agenda contains lots of items that are of no relevance to the majority of attendees, so by all means give people the option of putting forward suggestions for the agenda topics but sanity check them before they make it on to the list. Take it in turns to be the chair: this method also allows quieter members of the team an opportunity to speak and take the lead. However, keep the role of minute-taker yourself or delegate it to a trusted colleague, as you need to be confident in the completeness and accuracy of the minutes. Do not assume action points from the previous meeting have been completed – go through the minutes, ask for updates and if an action is not done, carry it forward. Set a firm start and end time, and consider imposing penalties for those who are late. Calculate the cost of the down time in the meeting if you do start late: sometimes sharing the astronomical financial figures relating to lost productivity can be enough to prompt people to turn up on time for the next session! The guidelines above still apply for a meeting held ‘virtually’ i.e. by video, web or audio conferencing. The interpersonal relationships and reactions between your colleagues will be harder to understand and respond to if your participants are not co-located, so this method works better for short meetings with a clear structure and purpose. If you can’t see who is speaking, ask everyone to introduce themselves when they start to speak (‘It’s Alan – I think we could deliver that feature by Friday.’) You can also level the playing field by asking everyone to join by conference call even if some people are able to meet face to face and dial in as a group. If you are clever about it you can fit a lot into an hour-long project team meeting. It just takes a bit of planning in advance and for you to brief your team about what to expect. Plan for productivity and you will be surprised at the results!